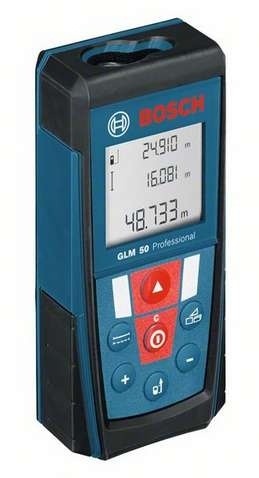 Measure smart with the Bosch GLM 50 Laser Measure. 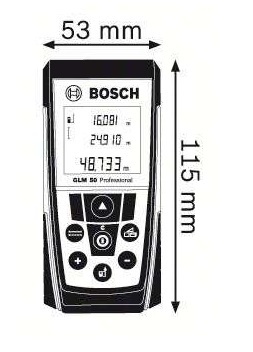 It is the most complete laser measurer in its class with precision laser measuring technology that measures up to 165 ft. Thanks to its .5 second measuring time, users can get measurements quickly in any of the tools five measuring modes. One of the GLM 50’s features is the ability to calculate inaccessible distances that cannot be measured directly (due to obstruction or lack of reflecting surface) using pythagorean theorem (a2+b2=c2). It offers three measuring reference points, front, back or center for use with optional tripod. At only 5 oz. 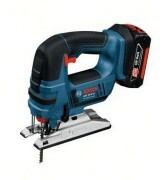 the GLM 50 allows for placement in a tool belt or pocket for easy accessibility while on the job.